You never know where you’re going to find inspiration for your quilling. The idea for this post came from a recent issue of Better Homes & Gardens magazine. As soon as I saw the bright, open blooms on the cover, I knew I had to figure how to quill them. So I set to work, and after some time experimenting, I can share them with you today. This week, I’m making quilling paper coneflowers. For those of you unfamiliar with coneflowers (as I was before some research), they grow in the eastern and central regions of the U.S. and they’re related to daisies. They are also known as echinacea, which can have some health benefits. The name echinacea come from the Greek word for “hedgehog” because of their spiky centers. And, that’s where we’re going to start with our flowers! To make the centers, sandwich about 8″ of golden quilling paper between two strips of dark red. But, instead of evenly layering the strips, glue them so there is just a hint of the gold peeking out from the end. Next, use small scissors to snip the gold paper into a fringe. It’s ok if you cut the red paper a bit, but I would try to avoid that as you can. Using a slotted tool, roll into a tight coil. Glue the end, and push the middle up into a dome. Remember to glue the underside of the dome to keep the shape! To get the spiked look, gently separate the golden fringe. I used my needle tool to pull the fringe away from the dome. Because the gold strip was layered between 2 strips of the deep red, the spikes will stick out in neat rows, instead of a lumpy mess. Now onto the quilling paper coneflower petals. Coneflowers can grow in all sorts of bold shades. When I was making mine, I worked with white, yellow, and a beautiful shade of orangey-pink called Blush from Quilled Creations. You’ll also need a quilling comb with very small, tight teeth. I’m using a small hair comb that I’ve had for years. First, roll the end of your strip slightly on a needle tool, and place that roll over a tooth on the comb. Next, wrap the rest of your strip around your comb, going from the back to the front, adding another tooth on each side as you go. I found that 4 prongs on each side of the center was the perfect size for my petals on this comb. Everyone’s tools will be a little different, so there may be some trial and error here. Notice that I lost the center roll at some point. That’s not really a problem for this project, because the petals will be pinched later on. So, no worries if this happens to you! Once you’ve got the size you need, tear off the extra paper. Glue the end and carefully remove from the tool. Repeat the same exact steps twice more. You’ll need 3 for each petal. Pinch one end of each, then line a little glue down one side, being careful not to apply any glue to the pointed end. Glue the 3 petal pieces together. Firmly pinch to the end that is glued together. The result will have one side that comes to a point, but the other end will still be separated. Each flower will need between 10-12 petals, depending on the size of your spiky center. Now, the tricky part is getting the petals to dry on the center while keeping the cone shape of the flowers. I made a system using 2 pins from the underneath and 1 through the center to keep it elevated. Then, use more pins keep the petals at an angle as they dry. Tacky glue is your friend here! It will help the petals stick a little faster. Keep adding your pins and petals all the way around your center. I wasn’t really concerned with the excess glue that is between the petals and the center but feel free to try to gently wipe it away with a small brush. After the glue dries, you can remove all the pins. You’ll see that the petals stay at an angle! 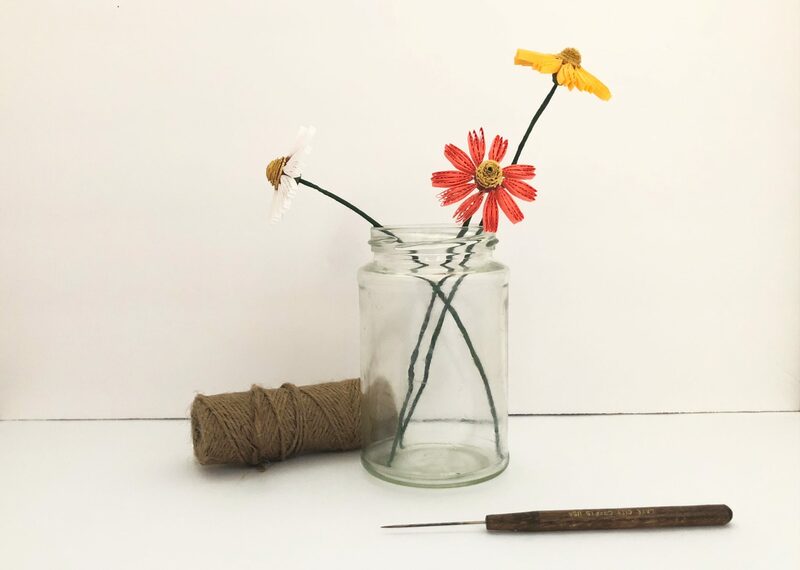 If you’re looking for flowers on stems, try using floral tape wrapped wire. Leave a small amount of the tip unwrapped. Roll a base from a leaf green and form into a dome. The strip that you use should be about as long as strip you used for the original spiky dome. Slide the center of the dome over the bare wire. Add some glue and place into the underside of your quilled coneflower. I love the simplicity of these quilling paper coneflowers! I can just imagine picking them from a field on a warm day. I know this seems like a longer challenge, but the petals do go quickly when you get the hang of them. Give this one a try and tell me how it goes! Very cute results. Thank you for this tutorial. Thanks Barbara! I’m glad you like them. Thanks! They really are pretty simple once you get the steps down. These looks so cute and easy, am considering making it this month. It’ll definitely take my gift wrapping skills to the next level with these on top of them. That would look amazing, I’m sure!